Keep enjoying soyfoods! With the rise of plant protein and meat alternatives, healthful eating, and dairy-free diets, soyfoods are poised to be one of the food stars of 2019. If your own eating preferences are driven by any of the following food trends, you’ll want to know the following about soyfoods. • Soyfoods are healthy, easy-to-incorporate ingredients for batch cooking and meal prepping. You can simplify your busy lifestyle by keeping versatile, lean soy protein on hand in your pantry, refrigerator and freezer. 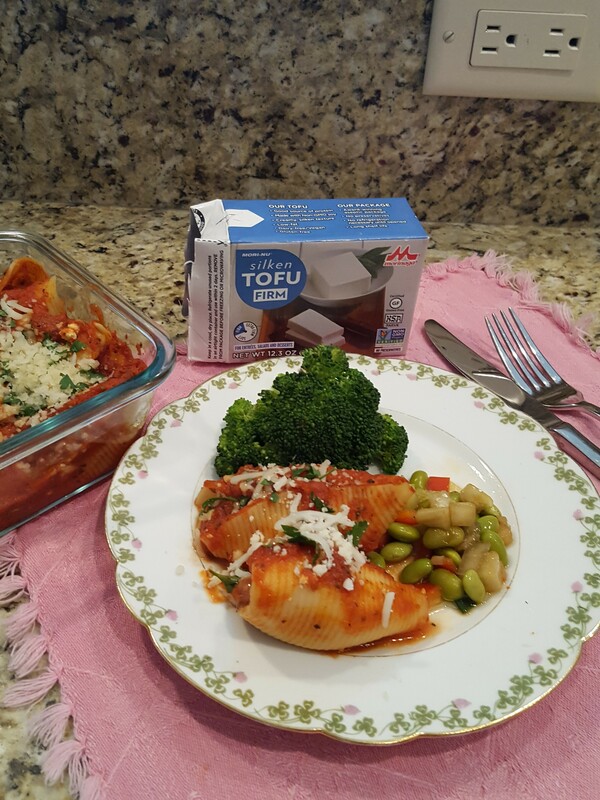 Choose from frozen edamame, refrigerated water-packed tofu, or shelf-stable TSP (textured soy protein). For example, you can prepare ready-to-add protein in advance by combining ground beef with TSP, then browning the meat mixture and freezing it in zip lock freezer bags. That way, you’ll have it on hand to add to batches of chili, pasta sauce, or lasagna. • Soy is the plant protein of choice. It is the only plant protein equivalent to meat. Soyfoods are high-quality plant protein, and provide all of the essential amino acids in the amounts needed for health, without the large amount of saturated fat that typically comes with animal sources of protein. One serving of soy—such as soymilk, soy nuts, edamame or tofu—offers approximately 7 to 15 grams of plant protein. • Soy is your go-to plant-based milk if you’re going dairy-free. One cup of soymilk is a nutrition powerhouse, providing approximately 8 grams of plant protein. According to the 2015-2020 Dietary Guidelines for Americans, soy beverages like soymilk — fortified with calcium, vitamin A, and vitamin D— are included as part of the dairy group because they are similar to milk in nutrient composition and use. Doing dairy-free is easy with soymilk, soy yogurt and soy versions of sour cream, ice cream, cream cheese, coffee creamer and more. • Soyfoods make it simple to create better-for-you versions of favorite recipes. Healthful eating is easier with soyfoods. Ingredients such as tofu, edamame, TSP, and soymilk are low in saturated fat, and none of them contain cholesterol. Soy-ize family favorites by replacing up to 40 percent of the wheat flour with soy flour in cookie and brownie recipes, or making dips and dressings with silken tofu in place of sour cream or mayonnaise. Start the day off right by adding TSP to oatmeal, or making smoothies with vanilla soymilk, frozen berries and honey. Enjoy steamed edamame in the pod as a protein snack, or sprinkle shelled edamame into salads or stir-fry dishes to add plant protein. For recipe suggestions and tips for cooking with soyfoods, visit The Soyfoods Council website at www.thesoyfoodscouncil.com.) You’ll also find information about recent soy-related research, and the health benefits of eating soyfoods. About the Soyfoods Council: The Soyfoods Council is a non-profit organization, created and funded by Iowa soybean farmers, providing a complete resource to increase awareness of soyfoods, educate and inform media, healthcare professionals, consumers and the retail and foodservice market about the many benefits of soyfoods. Iowa is the country’s number one grower of soybeans..
***If meat is desired, add 2 cups ground beef, chicken, turkey or pork that has been browned. Drain fat off before adding to tofu mixture. Add onions, carrot, ham, and garlic to pan; sauté 4 minutes or until lightly browned. Stir in broth and wine, scraping to loosen browned bits. Return chicken to pan; bring to a boil. Add Edamame. Cover, reduce heat, and simmer 10 minutes or until chicken is done. Remove chicken from pan with a slotted spoon; keep warm. Add whipping cream; cook, uncovered, over medium heat 8 minutes. Spoon ¾ cup orzo onto each of 4 plates. 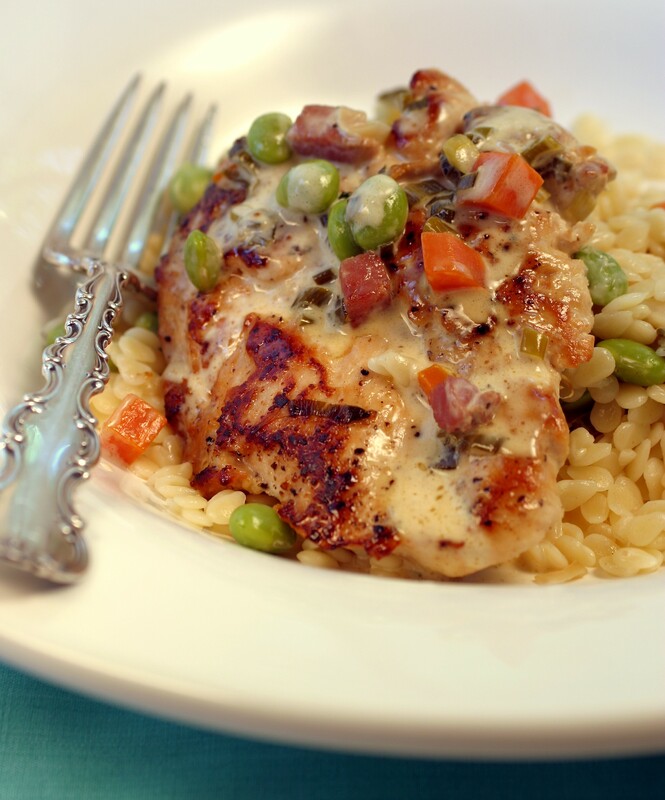 Top each with 1 chicken breast half, 1/3 cup sauce, and 1-tablespoon parsley.